Bullfight tickets to Segovia, all bullfights organized in the Bullring of Segovia. 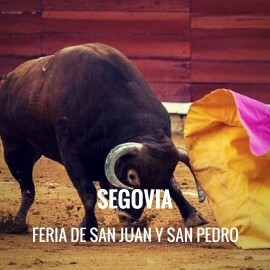 Feria en honor a San Juan y a San Pedro 2019. Fast and secure online ordering. Immediate information of all the Bullfighting Festivals. A virtual store with the most powerful technology and design of the sector. Easy navigation, transactions with high security and confidentiality of data. How to get to Segovia. Spring Bullfight: date to be confirmed. Feria en honor a San Juan y a San Pedro : date to be confirmed. Servitoro, Official Box office of bullfighting tickets sales at Segovia bullring.